CAREER: Played in 50 of a possible 51 games for a total of 1,055 snaps on defense … 5.5 of his 9.0 tackles for loss came in SEC play … All 3.5 sacks came in his last two seasons … Graduated in December 2017 with a degree in recreation and sport management. 2017 (SENIOR): Played 421 snaps in 12 starts at defensive tackle … Recorded a career season-high 22 tackles, including 2.0 for loss and 1.0 sack … at Ole Miss (Oct. 28): Logged the team’s only sack for an 8-yard loss in the 38-37 win … Named to PFF’s SEC Team of the Week with an 84.4 grade … vs. Missouri (Nov. 24): Posted 1.0 tackle for loss and a quarterback hurry. 2016 (JUNIOR): Saw action in all 13 games … Tied career high in tackles (9) … Posted career highs in tackles for loss (4.5) and sacks (2.5) … 2.5 tackles for loss came in SEC games … vs. Alcorn State (Oct. 1): Tallied first career sack for a loss of 13-yards … Finished with two tackles including 1.5 for loss … vs. No. 11 Florida (Nov. 5): Recorded a sack for a loss of 7-yards on a third-and-10 during the Gators’ final drive of the game … Also had one-half tackle for loss in the second quarter … vs. No. 24 LSU (Nov. 12): Followed up with two tackles, including 1.0 for loss. 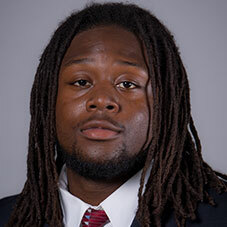 2015 (SOPHOMORE): Played in 12 games … Recorded a tackle during five of his 12 appearances on the Razorbacks’ front four … Totaled seven tackles, including 1.5 for loss, and one quarterback hurry. 2014 (TRUE FRESHMAN): Played in all 13 games as a true freshman at the defensive tackle position … Registered nine tackles, 1.0 tackles for loss and a batted-down pass … vs. Nicholls (Sept. 6): Posted three tackles, including 1.0 for loss in the home-opening win … vs. UAB (Oct. 25): Recorded a career-high tying three tackles in the homecoming victory. HIGH SCHOOL: Ranked as the No. 1 prospect from Arkansas by ESPN and 247Sports Composite rankings … 247Sports Composite ranked him as the No. 5 defensive tackle in the country, while ESPN tabbed him as the nation’s No. 6 defensive tackle and Scout ranked him as the No. 4 defensive tackle prospect in the country … Participated in the 2014 US Army All-American Bowl, recording two tackles to help the West to a 28-6 win … Helped lead El Dorado High School to a 6A state championship and a 13-1 record as a sophomore, recording 47 tackles, including eight for loss and two sacks … During his junior season he recorded 67 tackles, including 12 for loss and six sacks, and earned all-state honors … Helped lead El Dorado to another state title in 2013, the school’s fourth in five years, by recording 61 tackles, including 14 for loss, with one interception … Finished high school with 175 career tackles … Named to the Hawgs247 all-state team for the Class of 2014 and was twice named academic all-conference … Coached by Scott Reed … Received numerous offers and chose Arkansas over Alabama and Ole Miss. PERSONAL: Born on Nov. 6, 1995 … Son of Anthony and Michelle Jackson.